Megyn Kelly doesn't love to cook but she was bowled over by this simple and satisfying recipe. As part of the new "Try This TODAY" series, Megyn Kelly is meeting up with a dear friend of the show, chef Elizabeth Heiskell, to show off everything she’s learned over the last year in the kitchen. Elizabeth put Megyn through three tests: a flashcard round with basic cooking items, which Megyn had to correctly identify. Then they moved on to the speed round where Megyn had to julienne carrots, break down garlic and even peel potatoes. Finally, Elizabeth told Megyn that she’d be making a recipe from her cookbook, “What Can I Bring,” but this time, Megyn had to cook it from scratch! Despite some initial confusion and a few hiccups along the way, Megyn delivered in the end and made a chicken pot pie that was “so easy, even she can do it. 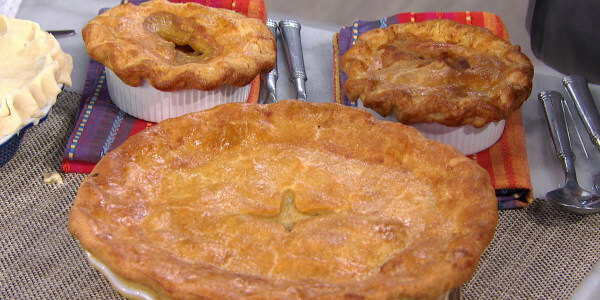 This classic pot pie is made easier with store-bought piecrust. It's the perfect dish for any cold-weather get together.